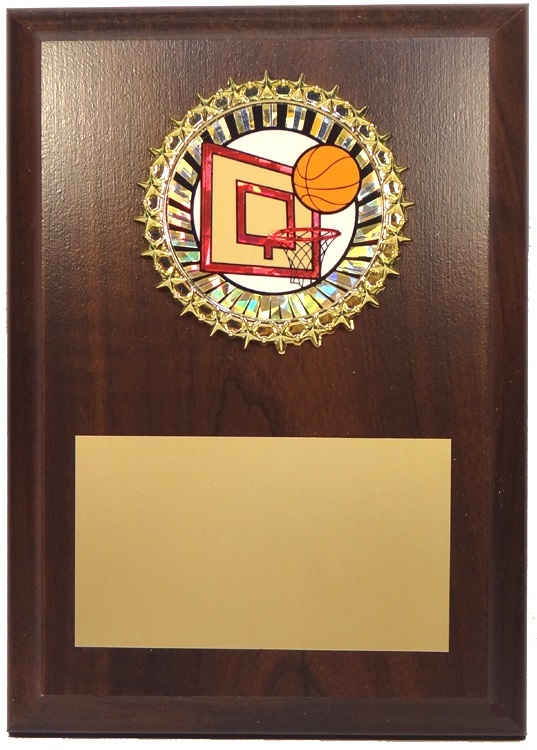 4" X 6" Cherry Plaque with Basketball mylar and medallion holder. 2" X 3 1/2" engraving plate. Price includes constant copy engraving / maximum of 50 characters. Add $ .50 per plaque for each name/line change. For EX. M46 plaque #1 says: 2012 CBA MVP John Smith - M46 plaque #2 says: 2012 CBA Most Improved Chris Mauro - Then add $.50 each for each M46 plaque that has different awards and names. If you are ordering more than 1 award, you can place the order for the amount of awards you need and e-mail the engraving on a separate e-mail to sals@victoryawardsandtrophies.com . Please include your name and transaction ID in the separate e-mail.